You will earn 1,822 Reward Points. Earn 1 reward point for every 1 dollar spent. NEW lower profile and aesthetics. Electronic controls with multi channel countdown display. Removable grease drawer in the front of unit for easy clean-up. Two-sided cooking heats your menu items in half the time, sealing in flavor. Heavy gauge, water resistant flexible plastic conduit protects electrical connections. The bottom platen has a patented splash guard to help keep products and grease in their place. Ergonomically designed control panel provides easy access and visibility to controls and grease drawer. NEW optional electronic control is rated from 175°F (79°C) to 550°F (302°C) and has 4 countdown timers. A heavy-duty commercial hinge system and handle provides safe and effortless operation of the top platen. Heavy-duty aluminum & iron platens provide long life and superior performance for high volume operations. Standard dial thermostat is rated from 175°F (79°C) to 550°F (302°C) and provides accurate sensing of temperature. Top platen leveling system lifts top platen parallel to bottom platen for a full 3 inches before rotating up, providing even cooking of thin tortillas to thick panini sandwiches and burritos. Expand your menu with Star’s Pro-Max two sided grill. Prepare “Panini” sandwiches, chicken breasts, hamburgers, steaks, wraps, vegetables and many other menu items quickly and easily while maximizing space. Grills are compact and portable providing flexibility in your operation. Two-Sided Grills can prepare sandwiches, chicken breasts, wraps, hamburgers and a variety of other menu items in your restaurant, cafe, concession stand, bar, or wherever you need high performance cooking. Metal tubular elements are standard. The lead-in cord is resistant to water and oil to protect wiring. Units available with aluminum, iron grooved or smooth platens. Star’s Two-Sided Grills are constructed of 18 gauge stainless steel. Star’s heavy-duty hinge mechanism is constructed of hardened aluminum for strength and durability. Furnished with a 6’ cord and standard NEMA plug. Other plugs available upon request. 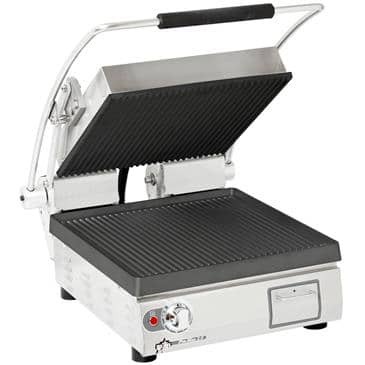 Star’s two-sided grills are covered by a one year parts and labor warranty. Two-Sided Grills are constructed with an 18 gauge stainless steel body. Aluminum platens are standard. A hinge mechanism provides easy operation for the top platen. Grilling height between platens is up to 3”. Metal sheathed tubular elements shall be provided as standard. Non-skid feet shall be standard. Unit shall be provided with six foot power cord with Nema rated plug (see specifications above). Units carry approval of UL, UL Sanitation or UL Canada Standards. Printed in the U.S.A.